The Nokia 7.1 is the latest mid-range premium device that comes with a traditional notch on top of it. However, it would be interesting to see whether the device will able to challenge the Xiaomi Poco F1, which has already created a lot of buzz in the market. 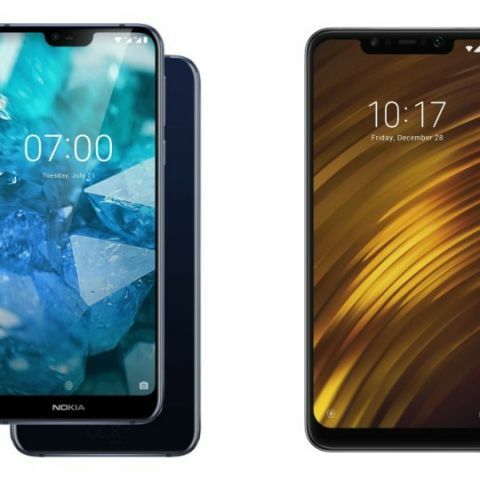 A few backs, HMD Global has launched its latest device the “Nokia 7.1” in Indian markets. The device features a 5.84-inch display and comes with a dual rear camera. The smartphone is priced at Rs 19,999 in India and exclusively available on Amazon. On the other hand, the Xiaomi’s Poco F1, which company gave the title of “best-rated flagship” device lies in the same segment as the Nokia 7.1. So, let’s do a quick comparison between the two to see which one is offering the best value of your money in terms of specifications. The Xiaomi’s Poco F1 features a slightly bigger 6.18-inch display in comparison to the Nokia 7.1, which comes with a 5.84-inch display. When it comes to the performance, the Nokia 7.1 is powered by a Qualcomm Snapdragon 636 processor, while the Xiaomi’s Poco F1 is backed by the latest Qualcomm Snapdragon 845 processor. As far as the cameras are concerned, both devices are equipped with a dual 12MP + 5MP rear camera. 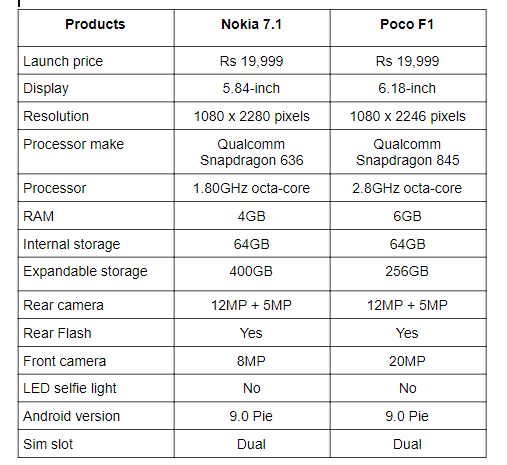 At the front, the Nokia 7.1 sports a 5MP unit, while the Poco F1 features a 20MP sensor. The Nokia 7.1 is available on Amazon for Rs 19,999, while the Poco F1 is available on Flipkart at a starting price of Rs 19,999.
when will you posting the full review of Nokia 8 and the comparison of Nokia 8 and Oneplus 5 and Oneplus5t?